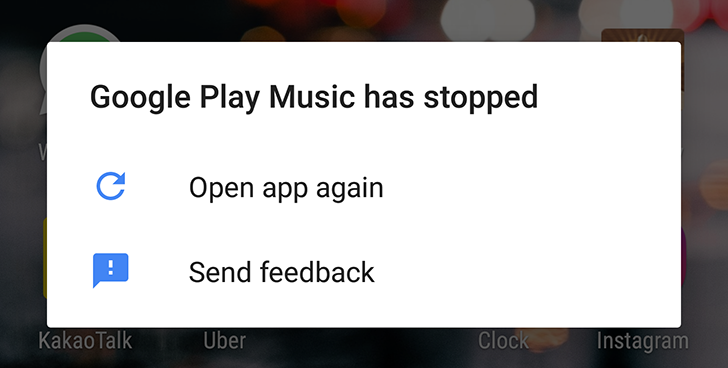 Google Play Music rolled out a new version of its app several hours ago that seems to bring a big bug in tow: many users are reporting that the app is crashing on launch so they can't listen to their music or use it at all. The culprit version is 7.9.4920 and based on the reviews being left on the Play Store, the issue isn't limited to just a few users. I've been scrolling through pages and pages of comments saying the same thing essentially: the app force closes immediately after you try to open it. It doesn't seem to be related to a specific device or Android version either: some are seeing it on the O Dev Preview, others on Nougat, some on a Pixel, others a Nexus 5X or Galaxy S7, and so on. The app is still working well for me, so it seems like a widespread but not a universal bug. If you're seeing the force close message, your solution for now is to revert back to the previous Google Play Music version 7.9.4918. If Play Music is a system app on your device, you'll probably have to disable it to revert to the original version that comes with your phone, then manually install v7.9.4918 by downloading the APK file from APK Mirror. And make sure you disable updates to Play Music in the Play Store, otherwise it will soon install the newer buggy version on top. We'll keep an eye out on Google Play Music and see if there's a new release to fix this crucial bug. Based on all the comments below, it looks like the bug is correlated with Bluetooth being on, and most likely with it being connected to a device. A temporary fix would be to turn off Bluetooth, open the app, then turn it on and connect to your headset or speaker. Google was fast in fixing this one. A new version 7.9.4921 has rolled out that should solve the Bluetooth-related crash issue. Early feedback seems to be positive about the bug disappearing. If you had reverted to an older version of Play Music and disabled automatic updates, or if you are sick of disabling and enabling Bluetooth to open Play Music without it crashing, you can see if the latest version is available for you in the Play Store or grab it manually from APK Mirror.